2 Comments on Intelligence, Strategic Foresight and Warning, Risk Management, Forecasting or Futurism? The focus of this website is anticipation for all issues that are relevant to political and geopolitical risks and uncertainties, national and international security, traditional and non-traditional security issues, or, to use a military approach, conventional and unconventional security. In other terms we shall deal with all uncertainties, risks, threats, but also opportunities, which impact governance, and international relations, from pandemics to artificial intelligence through disruptive technology, from energy to climate change through water to wars. This activity may be called more specifically strategic foresight and warning (SF&W) or risk management, even though there are slight differences between both. The definition we use builds upon the practice and research of long time experts and practitioners Fingar, Davis, Grabo and Knight. Broadly speaking, it is part of the field of anticipation – or approaches to the future, which also includes other perspectives and practices centred on other themes. SF&W can and does borrow ideas and methodologies from those approaches, while adapting them to its specific focus. For example, a country like Singapore with its Risk Assessment and Horizon Scanning – RAHS Programme Office, part of the National Security Coordination Secretariat at the Prime Minister’s Office, uses a mix of most of those perspectives, reworks and combines them for its own needs, while creating and designing original tools, methodologies and processes. Furthermore, various actors also use different names for SF&W, or very similar approaches. It is thus important to clarify what various labels and names mean, even if borders between categories are often fuzzy. Futures Studies (also futurology), practiced by futurists, have been developed since the 1960s. It has, initially, as main market for-profit organisations, i.e. companies and businesses, although it also increasingly tends to provide services to territorial collectivities and state agencies, generally in fields unrelated to security (e.g. urbanism, education, the future of work etc.). Considering the outlook of its founding fathers and related texts, it tends to be characterised by a pro-peace utopian outlook, an emphasis on human intent, a specific multi-disciplinarity focusing on economy and business, technology, some parts of sociology and anthropology, literary criticism, and philosophy. It also tends to have been influenced by post-modernism. It is most often taught in business schools or part of business programs, such as the Wharton School, Turku’s Finland Futures Research Centre, or the University of Houston. Hawaii Research Center for Futures Studies seems to be an exception to the rule as it is part of the department of political studies. It tends to be heavily grounded in a post-modern approach. Forecasting usually refers to the use of quantitative techniques, notably statistics, to approach the future. This is however not always the case and, for example, Glenn and Gordon in their exhaustive review, Futures research methodology, tend to use indifferently forecasting, futures methods and foresight. Understanding forecasting as quantitative techniques seems, nevertheless, to be the most generalized and clearer meaning. It is a tool that is or may be used in any discipline, for example demographics. It is also sometimes considered as the only proper way to anticipate the future. It then tends to ignore what has been developed in other fields and the reasons for this evolution such as the complexity of the world. Many approaches to forecasting are mostly business and economics oriented, although some parts of political science – notably those dealing with elections – or more rarely parts of international relations also use forecasting. Here, we may notably refer to the work of Philip Schrodt, or of the Political Instability Task Force – PITF (funded by the CIA). Foresight, notably in Europe, tends to be used for approaches to the future focused almost exclusively on science and technology, innovations and research and development e.g. the European Foresight Platform which replaces the European Foresight Monitoring Network (EFMN), but also elsewhere in the world. If foresight is meant to be used for other issues, then it is spelled out: e.g. Security Foresight. Horizon Scanning is used mainly in the U.K. and in Singapore – see the post “Horizon Scanning and Monitoring for Anticipation” for more details. For the CIA, “Reduced to its simplest terms, intelligence is knowledge and foreknowledge of the world around us—the prelude to decision and action by U.S. policymakers.” (CIA, 1999: vii). Note that Michael Warner (2002) references eighteen different definitions of “intelligence.” It is thus broader than SF&W and should ideally include it, although the SF&W function may or not be part of the intelligence system. A major difference that may be underlined between intelligence on the one hand, SF&W on the other, is that the first starts with and depends upon decision-makers or policy-makers’ requirements while the second does not (see the SF&W cycle). In the US, “National Intelligence Estimates or NIEs “represent a coordinated and integrated analytic effort among the [US] intelligence enterprise, and are the [Intelligence Community] IC’s most authoritative written judgments concerning national security issues and estimates about the course of future events” (ODNI, 2011: 7). 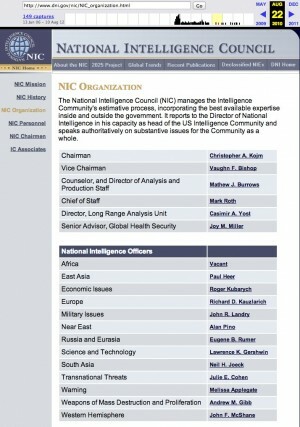 NIEs are produced by the National Intelligence Council (NIC). The NIC is heir to the Board of National Estimates created in 1950, that was morphed into National Intelligence Officers in 1973 and finally became the National Intelligence Council, reporting to the Director of Central Intelligence, in 1979. It is part of the ODNI, Mission Integration (MI) led by the Deputy Director of National Intelligence for Mission Integration, Edward Gistaro. They, however, result from a collective effort and process. “The NIEs are typically requested by senior civilian and military policymakers, Congressional leaders and at times are initiated by the National Intelligence Council (NIC)” (National Intelligence Estimate – Iran: Nuclear Intentions and Capabilities, November 2007 – pdf). They may use or not Strategic Foresight & Warning methodologies, and usually are concerned with a medium term (up to ten years) timeframe. Most of the time NIEs are classified, however some are public and can be found in the NIC (public) collection. For more details on the NIEs process, read, for example, Rosenbach and Peritz, “National Intelligence Estimates,” 2009. National Intelligence Assessments or NIAs are products such as the US Intelligence Community Assessment on Global Water Security (Feb 2012), or the 2008 National Intelligence Assessment on the National Security Implications of Global Climate Change to 2030. In the words of Tom Fingar, former chairman of the NIC, “The short explanation of the difference between an NIA and the better-known National Intelligence Estimate or NIE is that an NIA addresses subjects that are so far in the future or on which there is so little intelligence that they are more like extended think pieces than estimative analysis. NIAs rely more on carefully articulated assumptions than on established fact.” (Fingar, 2009: 8). Both the NIEs and NIAs emphasize and rate the confidence they have in their own judgements and assessments, which is rarely done elsewhere and should be widely adopted. La Prospective is the French equivalent, broadly speaking, for both futures studies approaches and strategic foresight (or Strategic Futures). We can notably refer to the work done by Futuribles, which is focusing on futurism for businesses, as well as teaching done at the CNAM, notably focused on innovation. Risk Management (initially known as risk analysis) is an approach to the future that has been developed by the private sector in the field of engineering, industry, finance and actuarial assessments. It started being increasingly fashionable in the 1990s. The International Organisation for Standardisation (ISO) now codifies it through the ISO 31000 family under the label of Risk Management. Risk management remains primarily a tool of the private sector with its specific needs and priorities, however those approaches are now widely referred to, incorporated and used within governments. Risk management includes monitoring and surveillance, as intelligence, strategic warning and SF&W. Risk Assessment is, as defined in risk management, the overall process of risk identification, risk analysis and risk evaluation. It tends also to be used in a looser sense, as in Singapore RAHS, or in the US DIA five-year plan, when the latter mentions that it will “Provide strategic warning and integrated risk assessment” (p.3). Political risk is most often practiced by many consultancies as a “classical” analysis of the political conditions in a country without much methodology, on the contrary from what should be done. Consultancies dealing with risk and political risk quite often actually deal with “risks to infrastructures” and direct operational risks. Here we are more in the area of tactical risks and daily collection of intelligence to prevent, for example, terrorist or criminal attacks on offices or exploitation sites. Risk governance is the label used by the OECD to address risk management. Although they started with a focus on economic and infrastructural risks, they now address all-hazards risk. (See also Strategic Crisis Management below). Although this tends to be forgotten in “anticipation circles” – or refused by part of the academia in the case of social sciences for various reasons – the first discipline to deal with the future is science as it can qualify as such only if it has descriptive, explanatory and predictive power (of course with all the necessary and obvious specifications that must be added to the word “prediction,” considering notably complexity science and the need to forget the 100% crystal ball type of prediction for the more realistic probabilistic approach). Strategic Analysis is a term that can be used by various institutions, for example by the Situation Awareness unit of the Finnish Security Police (SUPO), and is defined by them as a “general assessment of changes in the operational environment, incidents, phenomena or threats” for decision-makers.” We find it also mentioned in the DIA five-year plan as part of the strategic warning responsibilities. It can thus be seen as a part of SF&W. Strategic Anticipation is a loose term that can be used to cover all strategic activities related to the future. Strategic Foresight covers strategic anticipation for conventional and unconventional strategic issues as we do, however without the warning component. 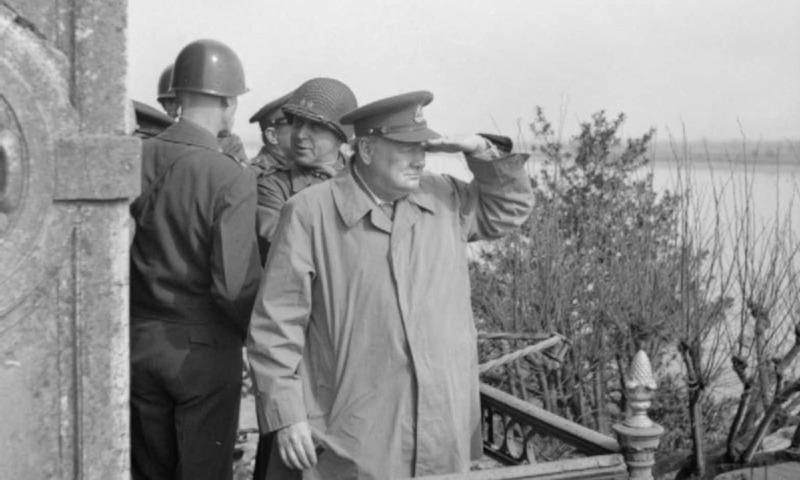 One example is the Clingendael Institute, a leading International Relations and Security think-tank uses the term Strategic Foresight for its corresponding department and research. Strategic Futures is a term that is used in the American intelligence system, for example with the Strategic Futures Group of the NIC. Prior to 2011 the Strategic Futures Group was named the Long Range Analysis unit. It contributes, besides the National Intelligence Offices, to the overall process that produces the Global Trends series of the NIC (latest Global Trends: The Paradox of Progress). Global Trends uses all available methodologies according to needs. Strategic Futures may be considered as synonymous with strategic foresight, in its exploratory dimension. It may also integrate a warning dimension, and in this case, would be equivalent to SF&W. Indeed, it is interesting to note that the National Intelligence Council used to have among its National Intelligence Officers a National Intelligence Officer for Warning (as shown here in the cached version of its public website for 22 August 2010 – This office had been created by the Director of Central Intelligence Directive NO. 1/5, effective 23 May 1979). This Office then disappeared (compare for example with cached version for 10 April 2011), while the Long Range Analysis Unit was renamed in Strategic Futures Group. If the National Office for Warning disappeared from the NIC, Strategic Warning (also known as Indications and Warning), and which aims at avoiding surprises, remains nonetheless crucial within the US Intelligence system, as reasserted notably by the DIA in the 2012-2017 plan (read also Pellerin, DoD News, July 2012). The strategic warning mission of the DIA was reasserted in June 2018 in “Defense Intelligence Agency Bringing Forewarning into 21st Century” (DoD News). Strategic warning covers notably “necessary collection and forward-looking analytic methods and techniques, … to ensure warning is conveyed accurately and in a timely manner.” (p. 6). It is very similar if not identical to SF&W, but emphasises the warning aspect. Also in the warning section, one finds the appellation that is promoted notably by the European Union, as Early Warning Systems (see 2011 Council Conclusions on Conflict Prevention building on the Treaty of Lisbon – Article 21c), and which tends to be focused essentially on conflict prevention. Note that the four steps of the process (1/ scan for high risk and deteriorating situations, 2/identify ‘at risk’ countries that require further EU analysis and action, 3/analysis including setting explicit objectives in preparation for early preventive or peacebuilding actions, 4/monitor the resulting actions in terms of impact on conflicts (see EU factsheet on EWS), on the contrary from what is promoted in intelligence notably for ethical reasons including those relative to the democratic mandate held only by policy-makers (e.g. Fingar, Lecture 3, pp. 1-2, 6-7) quite largely integrate early responses within its system. meanwhile, the available types of actions are pre-determined and consist of “preventive or peacebuilding” actions, although the broad appellation may leave some leeway in terms of establishing an efficient strategy then operationalisation of the answer. Also contrary to other approaches, EWS deal exclusively with conflict as issue. The very specificities of the European Union in terms of its evolving institutions, the way decisions are taken and the competences (see EU competences) and prerogatives of each of its institutions according to areas, has strong influences on the approach promoted for Early Warning Systems. Notably the specificity of the Common Foreign and Security Policy – CFSP (see EU Special competences) is highly constraining on the design and then practice of early warning. Finally, the possibility to see the CFSP evolve towards more common defence notably, considering changes in the EU and international context – post Brexit, election of U.S. President Trump, election of France staunch EU supporter President Macron – (e.g. Paul Taylor, “Merkel’s thunderbolt is starting gun for European defense drive“, 30 May 2017, Politico), is highly likely to lead to changes in the EU approach to “Early Warning”. Strategic Intelligence is a widely used but rarely defined term that Heidenrich (2007) describes as “that intelligence necessary to create and implement a strategy, typically a grand strategy, what officialdom calls a national strategy. A strategy is not really a plan but the logic driving a plan.” According to the way intelligence and security are understood, strategic intelligence and strategic foresight, or rather in this case strategic foresight and warning will more or less largely intersect; to the least they will need each other. “Unconventional,” from a Department of Defence perspective, connotes national security conditions and contingencies that are defense-relevant but not necessarily defense-specific. Unconventional security challenges lie substantially outside the realm of traditional war fighting. They are routinely nonmilitary in origin and character.” Nathan Freier, Known Unknowns: Unconventional “Strategic Shocks” in Defense Strategy Development (Carlisle, PA: Peacekeeping and Stability Operations Institute and Strategic Studies Institute, U.S. Army War College, 2008), p.3. Note that the Society for Risk Analysis considers risk assessment and risk management as part of risk analysis. The ISO31000 was first published as a standard in November 2009. The ISO Guide 73:2009 defines the terms and vocabulary used in risk management. A new version of the guidelines, ISO 31000:2018, Risk management – Guidelines, was published in February 2018. The other ISO documents related to risk management remain unchanged. Central Intelligence Agency (Office of Public Affairs), A Consumer’s Guide to Intelligence, (Washington, DC: Central Intelligence Agency, 1999). Fingar, Thomas, ”Myths, Fears, and Expectations,” Payne Distinguished Lecture Series 2009 Reducing Uncertainty: Intelligence and National Security, Lecture 1, FSI Stanford, CISAC Lecture Series, October 21, 2009 & March 11, 2009. Fingar, Thomas, “Anticipating Opportunities: Using Intelligence to Shape the Future,” Payne Distinguished Lecture Series 2009 Reducing Uncertainty: Intelligence and National Security, Lecture 3, FSI Stanford, CISAC Lecture Series, October 21, 2009. Grabo, Cynthia M. Anticipating Surprise: Analysis for Strategic Warning, edited by Jan Goldman, (Lanham MD: University Press of America, May 2004). Glenn Jerome C. and Theodore J. Gordon, Ed; The Millennium Project: Futures Research Methodology, Version 3.0, 2009. Heidenrich, John G. “The State of Strategic Intelligence”, Studies in Intelligence, vol51 no2, 2007. Knight, Kenneth “Focused on foresight: An interview with the US’s national intelligence officer for warning,” September 2009, McKinsey Quarterly. Pellerin, Cheryl, DIA Five-Year Plan Updates Strategic Warning Mission, American Forces Press Service, WASHINGTON, July 18, 2012. Rosenbach, Eric and Aki J. Peritz, “National Intelligence Estimates”, Memo in report Confrontation or Collaboration? Congress and the Intelligence Community, Belfer Center for Science and International Affairs, Harvard Kennedy School, July 2009. Schrodt, Philip A., “Forecasts and Contingencies: From Methodology to Policy,” Paper presented at the theme panel “Political Utility and Fundamental Research: The Problem of Pasteur’s Quadrant” at the American Political Science Association meetings, Boston, 29 August – 1 September 2002. Warner, Michael, “Wanted: A Definition of “Intelligence”, Studies in Intelligence, Vol. 46, No. 3, 2002.